Earlier this week, I shared a picture on Facebook about how I had cooked and frozen 30 lbs. of ground beef. Every time I share a picture like that, it always surprises me how many comments and emails I get, so I thought I would break it down for everyone. This is an ESSENTIAL part of my Back to School routine. Other moms are out there getting pencils and bookbags and making sure they’re kids have cute outfits. I’m in the kitchen prepping freezer meals. I swear it saves our sanity when school starts and suddenly they have 2 hour sports practices and entire books to read in one night and they just haaaave to play with friends (you know, the ones they could have played with all summer). Let’s be clear from the start, though. When I say that I’m making freezer meals, they’re usually meal starters. I don’t really do casseroles, so our dinners usually consist of a meat, vegetable and sometimes a carb. The part that I make-ahead for the freezer is usually just one component of this, not the entire meal. Chop your veggies first. I always add onions and green peppers and if carrots are on sale, I’ll throw them in as well to bulk it up. Adding more veggies will stretch your meat further, add nutrients to your dish and only add more flavor. I don’t know if there is anyone around who dislikes carrots as much as I do, and I can’t even taste them when I add it to our ground beef! I use my food processor and chop all my onions and transfer to a mixing bowl then do the same with the peppers and carrots. Depending on how much meat I’m cooking that day, I usually do a minimum of 5 lbs. of each but sometimes more. Just cook it like you normally do! I cook mine in a frying pan, but I know others will use a slow cooker. I usually have at least 2 large frying pans going at once, because if I’m standing there anyways stirring, then I might as well be stirring 2 skillets. For each pound of ground beef, I’ll add roughly, 1/2 – 2/3 cup of each veggie. I’ll be honest, I don’t measure.. I just dump it in. After it is cooked, drain the grease and transfer meat mixture to a bowl or cookie sheet to cool, so you can use the pan to cook your next batch. Once the meat mixture is cooled completely, transfer in your freezer containers. Everybody has a preference for what they use. I choose to use resealable plastic bags, because it allows me to get more air out than a container. If you have a vacuum sealer then I’m jealous of you and you should use that. Remove all of the air from your container and then seal completely. If you’re going to use your meat later and find you have freezer burn, it’s most likely because you didn’t let it cool completely or you left air in your container. I spread the meat out in my bags in a uniform, thin layer and then stack them on a cookie sheet. I place the entire cookie sheet in the freezer until they’re frozen solid, Then you can remove cookie sheet and stack the bags in your freezer. Having them freeze solid on the cookie sheet will make them much easier to store afterwards and take up a lot less space. We usually use our ground beef within 3-4 months using the freezer bag method. If you’re using a storage container that holds more air, you’ll find this length of time is shortened considerably. If you vacuum seal, you can probably get away with freezing it for longer and still not experience freezer burn. It really depends on your method of freezing it, but I would suggest using it within 2-4 months. I try my hardest to remember to set it in the fridge the night before I want to use it. It thaws quickly, and this is usually the perfect amount of time. If I need to use it within a couple of hours, I will put the entire sealed bag in a cold water bath until it’s thawed. If I need it immediately, I transfer it to a microwavable container and use the thaw setting on my microwave. and anything else that you would normally add ground beef too! I promise you, it makes dinner sooo much easier, clean-up faster and allows the rest of your family to help out even more! I’m very fortunate that our local grocery store usually runs incredible deals like I outlined here. Ask the butcher if you can get a price reduction for purchasing large quantities. Let them know you’re purchasing 20-30 lbs., and see what the lowest price they can give you is. Always buy bulk. You will forever pay more money if you’re buying 1 lb. packages at a time. Even if I’m scrambling and need to run out for just 1 lb. of meat, I will still buy at least 5-10 lbs and just quick throw the rest in the freezer, because it is just so much cheaper to buy in bulk. I also have a number of friends who order bulk meat through Zaycon Fresh. I have never used them personally, but I’ve heard rave reviews about the quality, price and convenience of purchasing through them. Whew! That was a veeeery long-winded way of sharing how we make dinnertime easier! I also have a video I made on my original freezer meals post where I share how I make 46 meals in under 4 hours for less than $100!! This was the post that started it all! So do you drain all fat and juices before freezing or leave a little in? Would it help to wrap in plastic wrap before placing it in the storage bag? 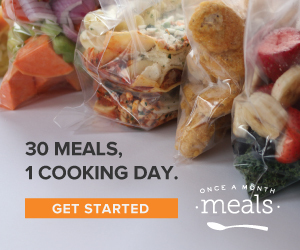 I am looking for meals to make life easier with kids and school and mom on the night shift. Any help would be appreciated. I freeze ground beef all the time. I cook up scrambled hamburger with spices – onion powder, garlic powder and black pepper (never salt). Drain completely, I use a colander over a large pan to catch all the dripping to save for soup and gravy flavoring. When meat is fully cooled, I put it in a freezer bag, in single use size, remove as much air as possible and seal. I place these bags in a single layer in the freezer until the following day and then stack vertically like books in plastic containers for easy removal. If I would use one pound of meat for a dish, then I usually freeze packages of about 12 ounces of cooked meat. I also freeze raw meat (approx 8oz) in sandwich bags. We meat, place in bag, remove extra air, flatten, freeze flat, when I stack vertically in plastic boxes in the freezer. I freeze all my mean in portion specific sizes for easy use. If you buy meat that is wrapped in a foam tray, repackage before freezing and it will keep much longer. Make sure all your work surfaces and utensils are clean, and that you do not cross contaminate your product. Hello 🙂 how come you never use salt, does it affect the meat when freezing? I have never done this so I’m completely new to freezer meals but plan to start. Thank you! In all the years of me writing this blog, you are the first person to notice that I very rarely use salt! I feel like I should give you an award or something! Ha! We hardly ever use salt in our house because my husband has a kidney disease and needs to be on a low sodium “diet” for that reason. You absolutely can use salt when you make it and yours will probably taste better than mine!